Figure 1. CU. Prairie Restoration Site with Willetts Hall (left), Big Bluestem grass (Andropogon gerardii) and Rosenweed (Silphium integrifolium), both tall members of the original prairie in Ohio. described on the right. The land is currently being pastured. Bikeway is just beyond the tree line at the horizon. corridor, now known as the "Prairie Grass Path" bikeway. Rare prairie plant species, such as the Royal Catchfly (Silene regia) are threatened by agricultural weeds and other impacts along the narrow prairie remnant. BIO 3800 Biological Research students developed a landowner survey and informative flyer designed to establish acquaintance with landowners along the “Prairie Grass Path”, largely in Madison and Clark counties. 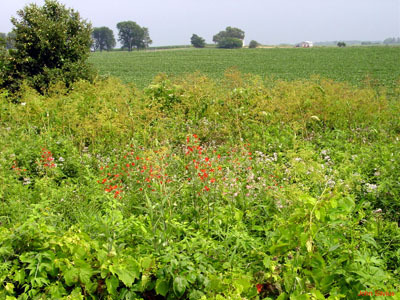 The objective was to “widen the narrow slice” of prairie remnant habitat by enlisting local landowners, mostly farmers, to devote portions of their adjacent farmland to prairie restoration through a conservation reserve program (CRP), or by other means (Figure 3). Establishment of “restoration projects” along the bikeway will serve to “buffer” and protect the narrow, and hence, vulnerable prairie remnant communities from the agricultural activity which can introduce pesticides and weeds to the remnant. The prairie restoration areas will add beauty and diversity to the otherwise monotonous agricultural landscape through which the "Prairie Grass Path" traverses. We have established a relationship with one landowner in the London area who is placing part of his land along the “Prairie Grass Path” into a CREP. He is agreeable to planting additional forbs on this land. 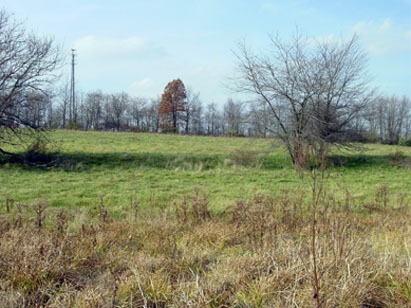 This land is adjacent to one of the most diverse prairie remnant areas as well as a riparian community of a major Scioto River tributary. As such it will have great potential to protect the prairie remnant and the watershed as well. 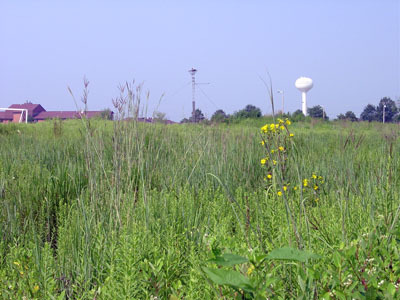 In Fall, 2006, the Prairie Working Group and students of BIO 3800 Biological Research initiated several projects to extend land stewardship and restoration efforts to some of our neighbors in the Cedarville area. We have an ethical responsibility to care for the Earth and to be stewards of the land and resources entrusted to us. The environmental stewardship ethic is rooted in the commands in Genesis 1: 26-28 for humans to exercise "responsible dominion" over the creation and to "keep the garden" (Genesis 2:15). If this is true, then we have a responsibility to our neighbor to share ideas and approaches that will assist him or her to exercise better stewardship of land, resources, energy, and time. There are at least several landowners in the Cedarville area who would be open to discussion and perhaps cooperation in developing a plan to modify their land use plan in such a way as to implement good creation care practices..
Four student members agreed to work in two teams. 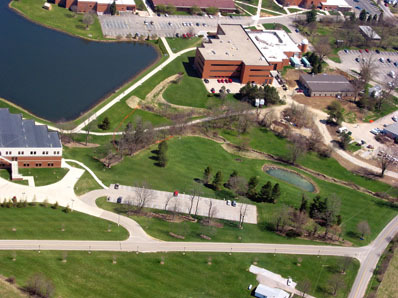 One group focused on landowners who are also faculty or staff members of Cedarville University. The other group focused on residents who own land adjacent to the former railroad, now the bikeway named "The Prairie Grass Path." In both cases, opinion surveys were used to open dialog with potential contacts. The results and current status of these efforts are summarized below. 27% own four or more acres. 20% were at least somewhat discontent with their land use plan. From this survey, we selected one client who has a 30-acre parcel along the bikeway (Figure 2) and we worked with them to develop a detailed “Conservation Plan” which provided an assessment of the land and proposed options that would allow the landowner to move from a livestock-grazing plan to a more suitable land use for development of plant and animal habitat while still meeting requirements for tax reduction for agricultural land use. As of 2007, this client is planning to proceed with several of the options in the "Plan" with implications for improving wildlife habitat, protecting native plant species from cattle grazing, and making the land accessable to the public for their enjoyment. Students of BIO 3800 Biological Research met with Mr. Rodney Johnson, Cedarville University Budget Director, and reached agreement on a plan whereby we could perform a survey of the land area along what we have called “Cedar Creek” which flows from the Cedar Lake dam to Cedarville-Yellow Springs Road (Figure 4). This portion of the CU campus consists of a riparian area with rich soil adjacent to the small stream and a small pond constructed to capture drainage water from construction of the Stevens Student Center. The stream has a high diversity of woody and herbaceous plants. A management plan which would conserve much of this biodiversity, protect the stream, aid in restoring water quality of effluent from campus, and provide a haven for songbirds was submitted to Mr. Johnson. Initial steps in management of vegetation along the stream have been undertaken and will be continued during Winter, 2007. Figure 5. 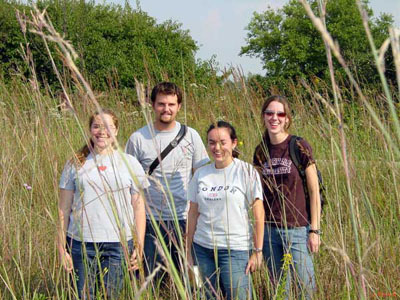 Members of the Fall, 2006 Prairie Working Group: Lizzy, Nathanael, Tara, and Jessicah, all partially obscured by Big Bluestem grass while visiting the Selma Prairie remnant, east of Cedarville, OH.